A full shield is required when working in environments where the whole face could be at risk from various projectiles such as molten metal, chemicals or electrical short circuit arcs. Each model has it's own unique set of properties so make your choice carefully depending on your particular working environment. 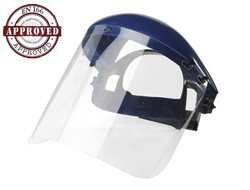 An entry level face shield with flip-up visor and plastic brow guard. It is adjustable to any head size and conforms to all the minimum safety standards. 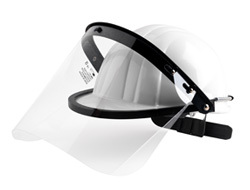 A neat little visor that fits to 99% of hard hats quickly and easily. It is rated to EN1731 with a easy flip-up design. 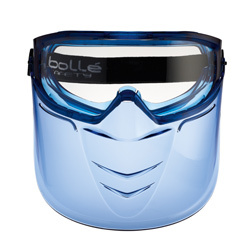 The highly popular Blast safety goggle combines with this removable visor to make an excellent and very versatile full face mask with all the added features of the goggle. Possibly the most popular mask available. 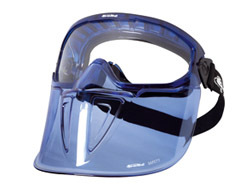 The highly popular Superblast safety goggle combines with this removable visor to make an excellent and very versatile full face mask with all the added features of the goggle. Possibly the most popular mask available. This lightweight face mask with flip-front visor not only has an anti-fog coating but is also made from 1.5mm Polypropylene, giving protection from short circuit electric arcs! 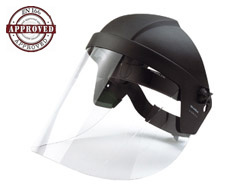 The more robust 2001 full-face shield with a flip-up visor that measures a huge 460 x 230mm. 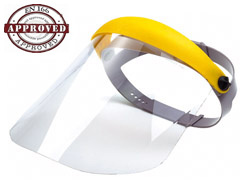 A high density Zytel plastic integrated brow-guard also extends to protect the whole forehead.